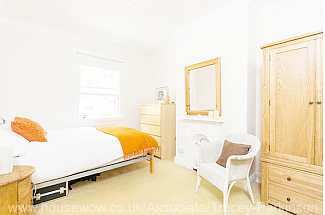 These bedrooms were transformed into havens of calm style and organised storage suited to children aged 5 to older teenagers. 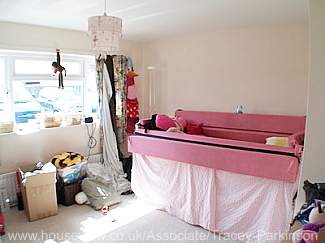 This cluttered teenager's bedroom needed addressing as the family were moving away and wanted to let the house. 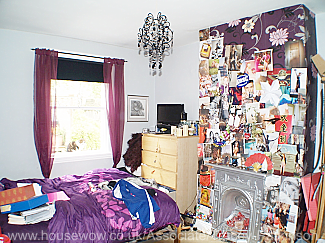 Stickers and clutter were removed and the room redecorated in a neutral style. With exactly the same furniture, but some fresh white bedding and pops of orange the room takes on a completely different appearance. The house let on the first viewing. This little girl had to sleep in a hospital bed, which the family were very keen to disguise. Her favourite colour is sunshine yellow and she loves fairytales and princesses. The solution was to build a fairytale castle around the bed with built in storage and a shelf for a reading light. 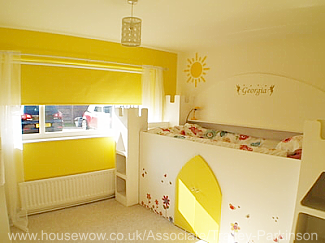 The doors in castle shape allow easy access to the bed's mechanism. A complete transformation and the family loved it. 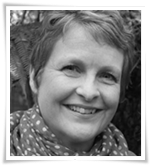 As children get older they accumulate many toys and collections which can result in clutter and disorganised items. When they are young this is usually a varied and wonderful time but as the years pass it is more difficult to see beyond the boxes, and decide how to change things for the better! These lucky people had a design consultation with Tracey Parkinson, who carefully helped them to consider what they and their parents wanted to achieve and then carried through the work. Budgets, storage needs, styles and age are all taken into account to present a transformation and enjoyable room to spend time in. 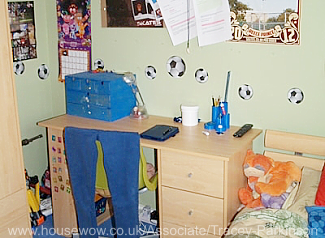 This little boy's room did not even have a bed as he disliked spending time there and preferred to sleep with his parents. He is a Star Wars fan, so the theme was chosen. 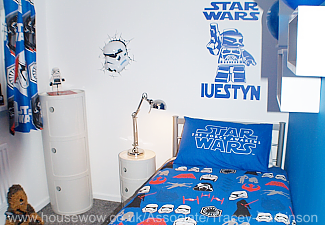 With the addition of storage for toys off the floor, a comfortable new bed and some fun Star Wars accessories he is now more than happy to sleep and play there. 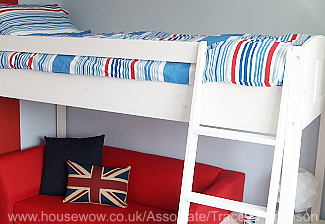 This young boy was transitioning to the teenage years and wanted a room with space to entertain friends and to host sleepovers. He also needed a place to study. The answer was a high sleeper bed with a comfortable sofa bed beneath. 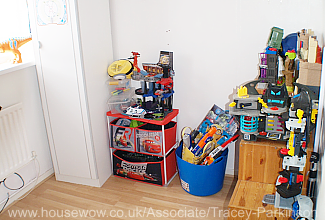 A bespoke unit was also built at the other end of the room with a slide out desk and plenty of shelving for storage.